In 2003, Shawn Collins and Missy Ward set up an Affiliate Summit Conference with the aim of providing educational sessions on the latest industry issues and promoting a productive network environment for affiliated marketers. Since then, the brand Affiliate Summit Inc. grown into Affiliate Summit Social Events, Performance Marketing Summit, FeedFront Magazine and more. Together with AppPresser, where we have a Node.js server for built had earlier this year. They asked for an app to enable connecting all visitors during the conference in a fun way. The goal described was simple: visitors must be able to approve or reject other visitors and to be able to chat with each other on approval. As an important reference we got the app 'Tinder', it had to look like that in its essence. Well with a different match algorithm and other nuances. Match Algorithm: users receive suggestions based on two variables; interests & residence. Log in: for this we have made an SSO connection with the CRM system of the Affiliate Summit. Backend: to manage and monitor everything, we have chosen WordPress in combination with Buddypress as the back-end system for this app. We have arranged this unbreakable, secure and performance focused. Roadmap Studios is a digital agency based in the heart of Amersfoort. We transform SMEs with new business models, processes and systems. Selling is social. Your CRM must therefore also be social. 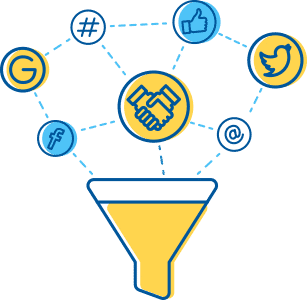 Combine the power of social media in your sales process for more awareness of your brand, to build better, stronger relationships and to close deals faster. 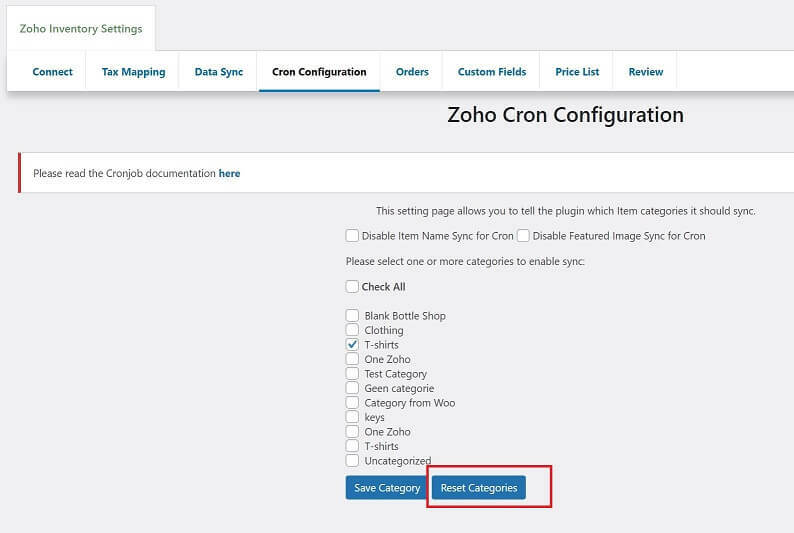 If your organization has profiles for individual products or services on social media such as Facebook and Twitter, you can easily manage them with Zoho CRM by adding them to the profiles under a brand. Through closer integration with Zoho Social, Zoho CRM seamlessly synchronizes all your brand profiles and settings in real time. Spend less time setting up the system and more time closing deals. Manage all your social media conversations with potential customers on Facebook and Twitter in real time. From sharing content to concluding deals, everything goes directly through the Social tab in Zoho CRM. Focus on the people and conversations that matter. Follow posts and conversations from leads, contacts or potential customers and stay informed. Add leads and contacts from social media. 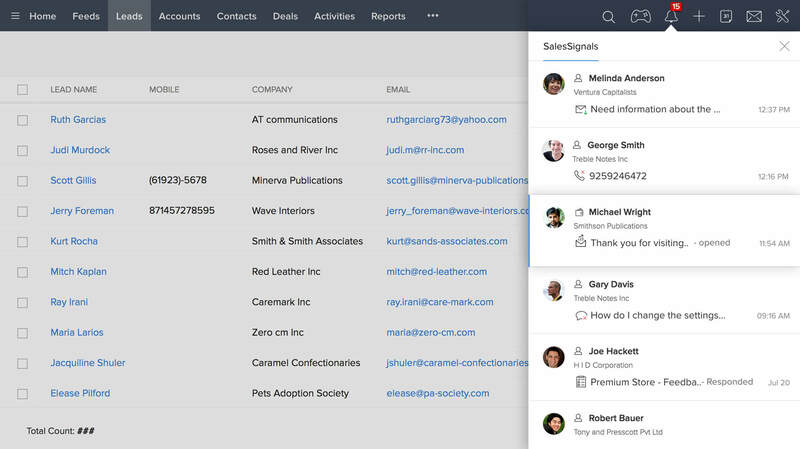 By integrating your call management applications with Zoho CRM, your team can have the CRM context with every call. Don't waste any more time dialing phone numbers and calling directly from Zoho CRM. 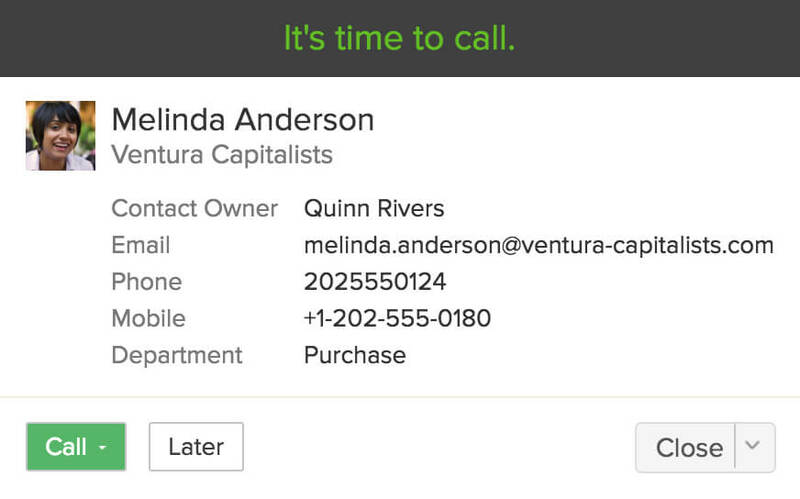 When you view a lead or contact, all you have to do is click on the call icon to make a call. It is difficult to keep track of which phone calls you need to make, if you are monitoring multiple deals and have to perform countless tasks. With the reminder prompts for conversations from the telephone function you never forget a conversation. Even if you have hundreds of customers, you can greet them all by name when you connect your phones to CRM. Start building customer relationships by viewing conversations, notes, and tasks that are conducted with regard to each customer. Thanks to automatic recording of call data, manual data entry is a thing of the past. Use the conversation's pop-up window to add notes, create follow-up tasks, or assign the contact to a representative. Measure the performance of your sales team and motivate them to deliver better performance with the help of call analysis. With built-in diagrams and reports you can visualize your conversation data and find out how you can offer a better customer experience. Zoho CRM is fully integrated with various popular providers of PBX and call management such as Twilio, RingCentral, Ring.io, Ozonetel, Knowlarity, Promero and more. Hold the attention of your website visitors in real time with live chat and increase your sales conversions. Via this highly interactive channel you can ask potential customers questions or give advice about the products that best meet their needs. Find out if a visitor is a returning customer or a new potential customer before you make contact. Receive a notification when a highly probable potential customer returns to your website, view this customer's deals in the pipeline and prioritize your efforts based on this. Don't let visitors slip away. If your website attracts 1000 visitors per day, it is easy to miss highly likely potential customers who visited your site. By automatically segmenting visitors into leads, potential customers and customers, Zoho CRM ensures that you always know who visits your site. Customer segmentations are shown in clear diagrams. Know where your visitors come from and what they are looking for, know what visitors with the most potential are on a given day, and more. Compare this measurement data over a period of time to identify trends and improve your customer interactions. Improve productivity with contextual email management. As a salesperson, it is essential that you know how to best communicate with your leads, potential customers and contacts. Write more powerful and more personal content by combining emails with contextual CRM data and analysis to get better responses from your contacts and potential customers. Don't let emails disappear from view. Use Zoho CRM reports that show when your emails have been delivered, whether they have been opened and when they have been read. 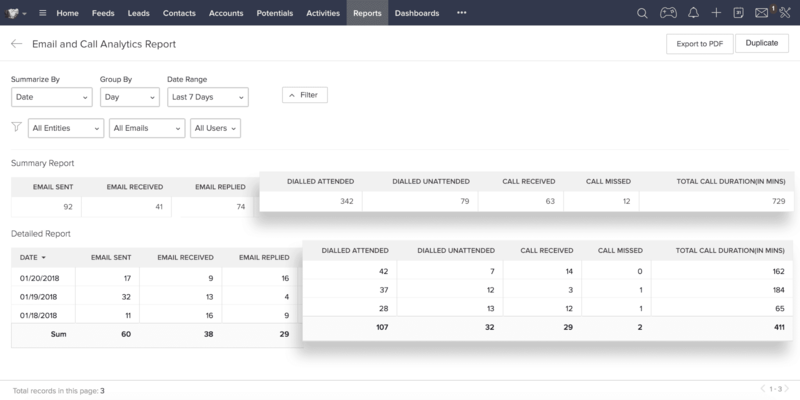 And because Zoho CRM links all emails to the relevant customer records, you never have to work through a pile of messages to send your next round of follow-ups. Templates are a quick and easy way to escape from the boring drafting of emails. Design a template that matches your style, or choose one from our gallery of special templates and customize it. 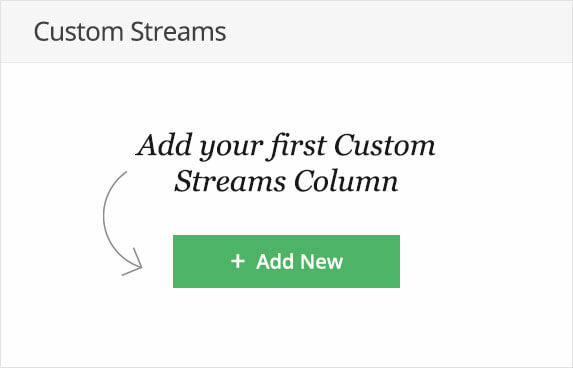 Use the template editor to drag and drop elements, such as text, images, tables, and columns, wherever you want. Know how your team is doing. A manager needs to know who performs well and who needs to perform better. Use Zoho CRM analyzes of each seller's account to create individual reports based on the number of emails they have sent per day, week or month. Compatible with your favorite e-mail system. Send and receive e-mails from your favorite e-mail client, such as Gmail, Yahoo !, Outlook and Zoho Mail, so you never miss a message. Use the standard e-mail configuration to link all incoming e-mails to your CRM. 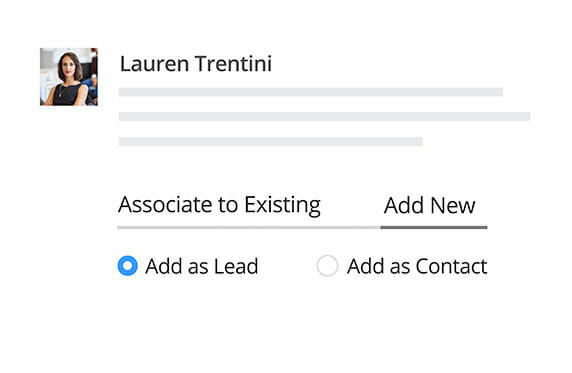 Integrate your CRM account with Zoho Campaigns to send emails in bulk to your leads, contacts, and potential customers. Start bulk email campaigns, analyze their performance with opening and click-through percentage reports, and import all leads and contacts from Zoho Campaigns into Zoho CRM. Share this messageDo you like this message? E-mail it to a friend!